Travelling with newborn or toddler is not an issue now. BABYZEN YOYO+ is a lightweight and compact stroller for a newborn. If you want to travel with your newborn baby or toddler, choosing the BABYZEN stroller may be a good idea. The best thing in this stroller is that it combines being lightweight with a fancy appearance. What does the BABYZEN YOYO+ offers? 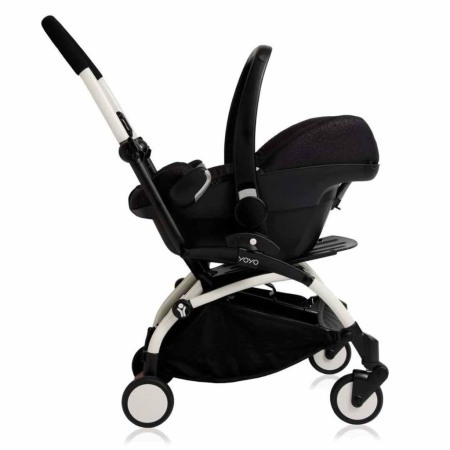 The BABYZEN looks really modern and it has three seating configurations. This stroller proves that not all the convertible strollers are bulky and heavy. In fact, YOYO+ strollers are really light compact. 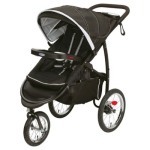 Lightweight stroller 20.47″ x 17.32″ x 7.08″ Lightweight and pretty compact, it weighs just 13lbs and comes in a wide range of colors. It is suitable for a newborn. The BABYZEN YOYO+ comes with a toddler seat. 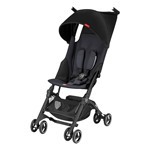 You can attach a baby car seat to make it a travel system, also suitable for newborns. 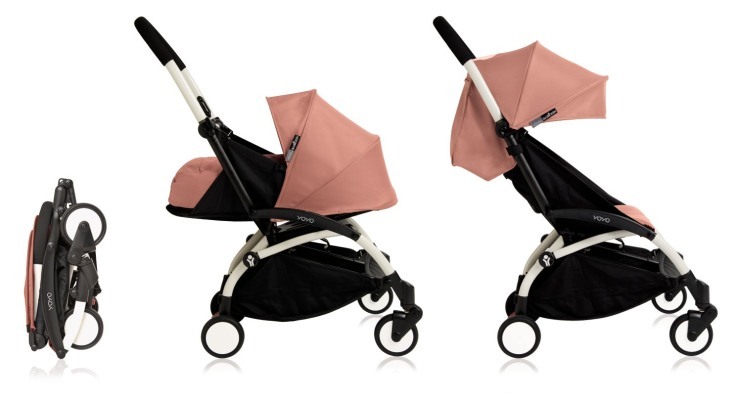 Fabrics of this stroller is available in nine assorted color combinations, and all of them look beautiful and it’s worth noting they are really subtle and eye-catching. I like the fact that the fabrics are easy to wash, and every mom knows it’s not hard to get the stroller dirty, especially during bad weather. Just remove the fabric and throw it into the washing mashine. I also like the fact that the padding is really soft, your kid will appreciate it too. While riding, your baby can watch the views because toddler seat is front-facing. Unfortunately, the toddler seat is irreversible. The backrest is adjustable and goes to 145 degrees, with a possibility to lock its position, giving your little one quite a bit of comfort. The seat has a 5-point harness, keeping your little passenger safe in place. Footrest provides even more comfort for your toddler while strolling. The BABYZEN YOYO+ can accommodate a kid up to 40lbs. The canopy has been made with UPF50+ fabric and comes with a peek-a-boo window, so you can check on your little one during a stroll. Overall – not the best canopy I’ve seen, but still pretty decent. The BABYZEN YOYO+ is not suitable for a newborn until you get a carrycot, sold separately. The carrycot is parent-facing, so you can keep an eye on your little passenger all the time. Attaching the carrycot is quite fast and easy and makes the stroller ready to use from day one, providing support for the newborns gentle back and head. It’s also equipped with a 5-point harness for extra safety. Still, it’s not suitable for night sleep, as it doesn’t have a self-stand option. The carrycot may accommodate babies up to 20lbs. 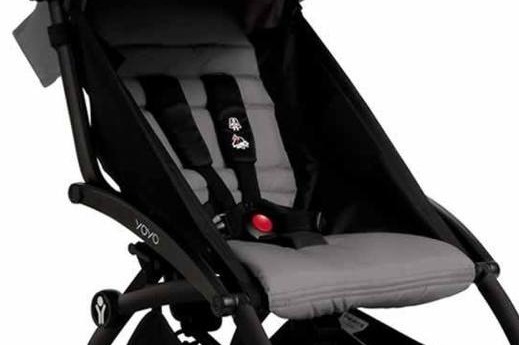 The BABYZEN YOYO+ may be easily turned into a travel system thanks to the compatibility with baby car seats, but you need to get the correct adapters to attach the seat onto the frame. Wondering if getting BABYZEN YOYO+ is a good choice? Check what others think about it, read the reviews at Amazon. 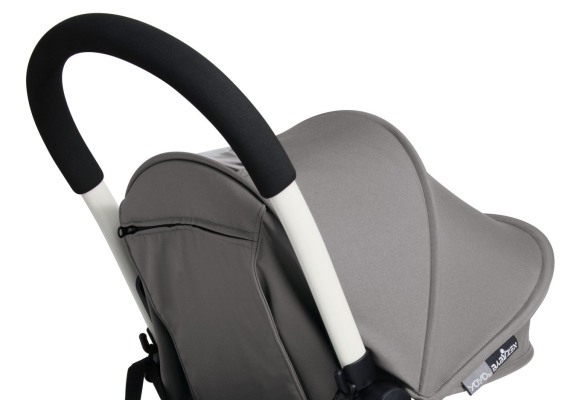 The BABYZEN YOYO+ is a lightweight stroller, so I wasn’t expecting a huge storage basked. Still, as for a lightweight stroller, the storage space is pretty decent. The backet is placed under the seat and may accommodate up to 11 pounds. The space it offers should be enough for everyday strolling – you may easily fit a diaper bag and some baby stuff too. The YOYO+ comes with some storage features also for you thanks to the pocket on the back of the canopy, which you can use to store your essentials like wallet, keys or phone and may be easily accessed. The YOYO+ has a fixed-height handlebar, sitting at about 42 inches from the ground. You should consider this fact and check this stroller before buying it. Placement of the handlebar makes it fine for parents between 5’1 and 5’8. I’ve checked the opinions of other parents and wasn’t surprised that most of them are just fine with such height, but any parent taller than 5’8 won’t find it comfortable and may end up with a backache. YOYO+ is a small and lightweight travel stroller, so, it has small wheels that are mainly designed for flat surfaces. It’s definitely not an all-terrain one, so it’s not the right choice for those moms who love to go into the woods or hike with their toddlers. Still, it will do its job the way you’d expect while shopping or taking a stroll around the city. Picking the right stroller isn’t easy, I know that perfectly. In case you’ve got doubts, it’s a good idea to check the reviews by those who already bought it at Amazon. The front wheels don’t have the locking option, but they have the so-called Soft Drive systes, promising that the stroller will adapt to the surface thanks to the 4-wheel suspension. Indeed, it makes the ride smoother, but again – it’s not an all-terrain stroller. The BABYZEN YOYO+ has a single brake found on the rear right wheel. I must admit that operating it is surprisingly easy. The wheels of this stroller are maneuverable and nimble. YOYO+ can fit anywhere because it is light and slim. You can handle this stroller with one hand only while holding any thing in other hand. 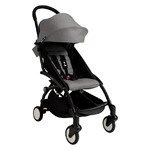 Narrow sidewalks, tight corners or the crowded area are not an issue for this stroller. The BABYZEN YOYO+ is lightweight and pretty compact. It weighs just 13lbs. Your back will thank you, as it will be really easy to carry around with you. Thanks to the shoulder strap and a chrome handle it’s even easier to walk with it. The folding process is really easy and requires you to use only one hand. Such feature always speaks for itself. Besides, the BABYZEN YOYO+ folds down to a tiny package and doesn’t take a lot of space, so it’s perfect for parents living in a small flat or having a small car. 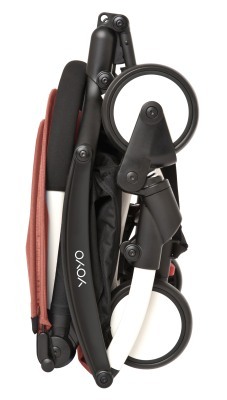 Having said that, I should add that you can also get a travel bag (it will be really useful if you’re planning to travel a lot with your little one) for this stroller, sold separately. The BABYZEN YOYO+ will be a perfect travel companions for parents who love to travel by plane, as it meets most carry-on regulations, so you can take it with you onboard. Thanks to its size, it will fit most of the overhead compartments so you won’t have to wait for the baggage or worry about the stroller getting damaged (imagine ending up abroad with a kid without a stroller). If you’re still unsure if buying BABYZEN YOYO+ would be a good idea, check what others think about it. Read the reviews of BABYZEN YOYO+ at Amazon. The BABYZEN YOYO+ comes in a wide range of colors: blue, navy blue, taupe, black, ginger, pink, red, and grey. As I wrote above, they look really cute and modern, eye-catching, but not flashy. 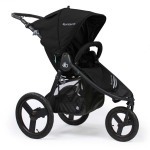 BABYZEN YOYO+ strollers are available with a carry case that will be useful while travelling or storing the stroller. You can also consider getting a rain cover. These are not the cheapest accessories, but worth the price. 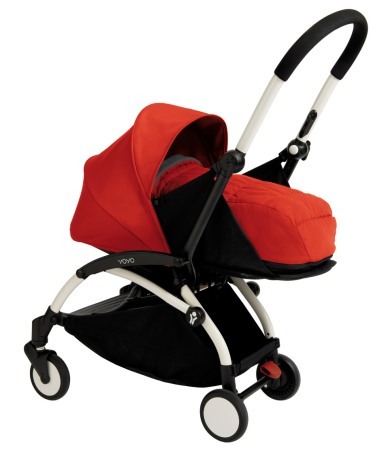 0+ newborn color pack – The carrycot for the BABYZEN YOYO+ is sold seperately. It’s a must if you’d like to use this stroller from day one. Provides a safe, fully flat position and you can keep an eye on your little one all the time. The carrycot provides a nice amount of protection both from sun and the wind. Comes in a range of nice colors, so you can pick the one that suits your style the most. Infant car seat adapters – You can use BABYZEN YOYO+ stroller as a travel system but you need adapters (sold separately) that can clip the car seat into the stroller. It is a wonderful thing for the parents who usually drive and want to keep their newborn children with them. Travel bag – If you think that the carry case is not suitable for you, consider getting the travel bag. 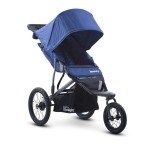 It has a shoulder trap that makes carrying the stroller around easy. Footmuff – Footmuff is also available. It helps to keep your baby warm in frosty winter days. Footmuff is available in seven assorted colors. It has a removeable top cover. BABYZEN YOYO+ board – Another thing I like about this lightweight stroller is that it offers a seating option for an older kid. You can attach a board with YOYO+ for your older kid. Your child can sit on the saddle or stand on board. The stroller can carry a child up to 44lbs. The board can be folded when you don’t need it. Parasol – Provides UPF50+ protection from sun and a nice shade cover for your little one during hot summer days. Insect shield – If you travel to a place full of nasty, flying insects, like a lake, you should consider getting the insect shield. It will keep your little one secure from them, but won’t block ventilation. Nice accessory, when needed. Cup Holder– Didn’t get a good sleep last night? This cup-holder gives you the possibility to take your coffee with you. 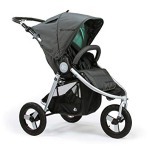 There’s no denying that BABYZEN YOYO + is not the cheapest lighweight stroller. If you are looking for a cheaper alternative, Ergobaby Metro may be a good choice. Check the comparison of these two strollers. 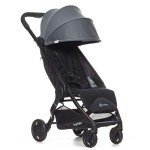 Suitability For Newborns The carrycot for the BABYZEN YOYO+ is sold seperately. It’s a must if you’d like to use this stroller from day one. You can attach the Newborn Kit and your stroller turns into a pram. You can get the Newborn Kit separately in stores. Canopy BABYZEN YOYO+ canopy is not the biggest one I’ve seen, but still pretty decent. 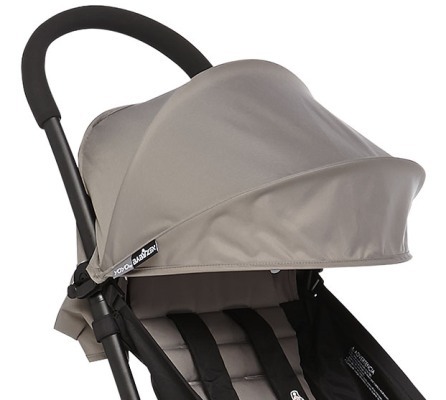 Ergobaby Metro comes with a sizable, extendable canopy that ensures that your baby’s eyes is safe from the sun rays. Will this one fit you? Same as with any other stroller – here’s my list of pros and cons to make the decision easier for you. The BABYZEN YOYO+ is designed for flat surfaces. 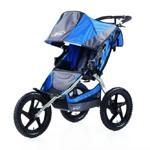 It will perfectly do its job on smooth pavements, malls or at the airport (as it is a great stroller to travel with), but it’s not an all-terrain stroller, capable of handling offroad terrains. 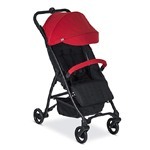 Still, it is a great, lightweight stroller, easily folded with one hand and doesn’t take a lot of storage space. 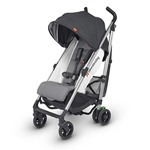 Being a lightweight stroller, I must admit it packs a lot of useful features and comes with some nice accessories, so if you’re looking for such a stroller, you definitely could give it a shot. Hard choice, isn’t it? If you’re not absolutely sure yet, I encourage you to check other parents’ opinions at Amazon. Welcome to my blog, dear moms! I'm Lindsey, happy mother of two, keen blogger, traveller who likes to cook and spend time reading a good book. If you have any questions or find it difficult to make a choice, feel free to message me - I'm here to help!